Located in the lovely little port village Tazacorte, the Apartments Kikere offer 10 self-catering holiday apartments. Included in this is one apartment adapted for wheelchair access and is disability friendly, Apartment 5b. The beach of Tazacorte is literally moments away and there is a great selection of cafe/bars and seafood restaurants to choose from. Along the pedestrian precinct to the front of the apartments there is an excellent range of facilities including a small supermarket, pharmacy and beachwear/walking shop. The Kikere apartments are ideal for self-catering holidays for couples, singles or families. Each apartment is a little different but all have a kitchenette which is equipped with fridge/freezer, 2-ring electric hob, microwave, toaster and coffee maker. Parking is nearby with on-street parking or in a car park, all of which is free. The lounge area has a comfortable settee which can be used as a pull-out bed for an extra guest. There is also a television and internet connection. Both one and two-bedroom apartments are available. Some apartments have a double bed and some have twin beds (two singles). The second bedroom is a single room but a supplementary bed can be added. The bathrooms have a step-in shower or a bath with the shower over. Plus washbasin, toilet and bidet. Ample towels are provided and these are changed twice weekly. *The ground floor apartment has a fully adapted bathroom for those with mobility difficulties/wheelchair users. All apartments have a balcony with sea view (except for the ground floor apartment). Some balconies directly overlook the sea, whilst others overlook the pedestrian area and the sea. At the top of the building are two spacious roof terraces, both easily accessible by lift or stairs. One of the roof terraces has a brick-built BBQ and sink and both have a selection of seating including reclining sun loungers, table and chairs. There is also an outdoor shower - a great idea to cool you down and freshen up. From the roof top terraces, you can enjoy watching the dolphin-spotting boats go by and the canoes and pedalos which are to rent. With unrivalled views over the Atlantic Ocean, this takes dining al fresco to a new level! 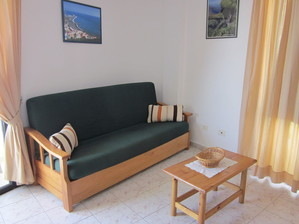 Price per week for two persons: 330€. Reduction for stays of longer than 10 days. Price for extra persons (5 total), please ask. If you are looking for an apartment at Tazacorte suitable for wheelchair users, the ground floor apartment is adapted for wheelchair access and reduced mobility. More information and photos of Tazacorte.